AS IT STANDS: Very Short Stories, Sorry-Assed Congress, and How's Your Day? Very Short Stories, Sorry-Assed Congress, and How's Your Day? 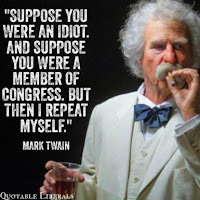 Who expects much to change in Congress when the clowns reconvene next week? Not me, that's for sure. The Republican majority in Congress has translated to zero progress. Not one major legislation passed. For eight years GOP leaders swore to repeal and replace Obamacare. We all know how that turned out. Now, we have to hope they can pass a spending bill to keep the government operating. If Trump tries to tie his wall fantasy to that bill there's going to be a problem. Donny Little-Hands has been mumbling about shutting the government down if he doesn't get his way. Will someone please slap that pouting man child and tell him to get real? I started another blog called Return To As It Stands where I indulge myself in writing very short stories everyday. I do my best to surprise and entertain readers within the space of 800-900 words. With Titles like, The First, and Last Dinner, Future Shock: The Test, and A Day At The Operating Table, I'll keep you guessing on how they end. Check it out. How was your day? Care to talk about it? I have a comment section below if you do. I just want to say that I love writing in it's many forms, and both of my blogs are labors of love.Thanks for stopping by.